The Duke Newsletter – June 2017 - Friends of Freshwater Inc.
Major construction projects across Freshwater have now either commenced or are progressing to conclusion. If a rough measure of economic activity is the “Crane Index”, then the Freshwater economy is relatively healthy. The coming influx of new residents, most of whom are downsizers, will have a flow-on benefit to businesses within Freshwater Village in particular. We now have the 17-apartment “Kahana” at 18 Marmora St., now being occupied by new owners. The retail and apartment complex to be known as the “Freshwater” at 22-26 Albert Street on the old Growers Site, is into construction of its upper floors and has only three more concrete pours prior to completion. Likewise, the 6-story headland site at 5 Pavilion Street, is moving out of the ground, with fixed crane installed. Hopefully this will be a more aesthetically pleasing building than the poorly constructed ugly duckling that the community endured for more than 50 years. It is now designated as 6 whole-of-floor apartments rather than the pokey 12 two bedroom apartments that previously existed. The demolition and excavation of the former disability services hospital “Sorrento Care” site at 12 McDonald St. Freshwater West has commenced for the construction of “the Pavilions” with 14x 3 bedroom well-appointed townhouses. All of these have been sold off the plan for high prices. A crane will no doubt appear on the skyline. The SEPP55 sites at 36 Wyndora (9 apartments) and 96 Soldiers Avenue (10 apartments) have either not commenced or are seeking modification to building approvals. All of these construction phases have inevitably tested the friendship of neighbours and the local community, with traffic control measures (or lack of), deliveries and concrete pours at all hours, crane movements, poor sediment control, as well as dust and noise, all causing concern. The community realises that it is desirable for these projects to be completed as soon as possible, but there has to be a balance between expediency and amenity. Building companies also have an historical reputation of asking for a centimetre of consideration but taking a kilometre. This is particularly the case for the demolition and excavation phase of these projects and the truck movements involved. GANELLEN TESTS THE FRIENDSHIP OF NEIGHBOURS WITH EXTENSION OF WORKING HOURS. The Mounties “New Dawn” development is moving ahead with the first phase of its construction of 98 leasehold apartments rapidly nearing the fit-out stage. These apartments are being constructed along Carrington and Lumsdaine Drives. The second phase will involve the demolition of the remaining Club buildings and their replacement with residential apartments, gymnasium and a swimming pool complex. Currently the South Curl Curl Boardwalk is closed due to the installation of a drainage pipe from the Diggers carpark to the ocean. In February this year, the construction company, Ganellen, submitted a Modification application to vary the DA to permit extended hours of construction, despite a range of concerns being raised by 30 local residents who live nearby, as well as the Friends of Freshwater. Council has approved work hours during the week up to 7pm and on weekends uptil 4pm. This work has to be undertaken behind completed facades of the building. The Developer argued that fit outs including the laying of carpet and the installation of kitchens would not be unduly disruptive to the amenity of neighbours. A hotline for complaints has been established by Mounties to expedite concerns raised. Freshwater has been identified as the most desirable and in-demand commuter suburb in Australia within 25kms of a capital city. This claim is based on the number of visits to the property site realestate.com. Freshwater had 4,382 visits in the 6-month period to 31 May 2017 surpassing other Sydney and Melbourne suburbs. Its location with iconic beach, and relatively close to the CBD with nearby, excellent, schools and public transport options, were cited as reasons why buyers viewed it so favourably. Visits to this site seeking Freshwater property vastly outweighed actual listings. On a recent weekend for example the Manly Daily listed only 3 properties open for inspection. This high demand has apparently resulted in an increase in the median house price to $2.1 million. For the second time in a year, Friends of Freshwater has mounted a campaign against an application for a Packaged liquor outlet adjacent to the Freshwater Village Plaza in the new “Freshwater “development. More than sixty individual submissions of objection were also lodged with the Department of Liquor and Gaming including from the local District of the Department of Health and the site’s near neighbour Freshwater Community Bank. Since 2010, the overall number of liquor licences in Freshwater has increased from a few to 11. This includes 3 packaged licences: 2 club licences; 6 on premise licences of which 3 have primary service authorisations. All of these are within 300 metres of the proposed packaged alcohol applicant. It should be firmly stated that our concern is not with those café and bar licensees that serve alcohol with the provision of food, or on occasions directly. but only with the excessive provision of packaged alcohol. Comparison of Liquor Licence Rates has Freshwater at double the State average and with the addition of this application, double that of any suburb on the northern beaches. It should be noted that these statistics do not include the packaged liquor outlet attached to the Harbord Beach Hotel licence. According to the NSW Department of Health, research indicates that, as the density of packaged liquor outlets increase in an area, the rate of adolescent alcohol use increases, with the most vulnerable young people being those aged 12-14years. Recently a large crowd of alcohol fuelled adolescents descended on the northern end of Freshwater Beach. Local Police with the Riot Squad struggled to break up the melee. Many of those involved were found to be in the 12-14 years’ age group. We have yet to be informed of the outcome of our submissions, but very few liquor licence applications have garnered such a strong oppositional response. FRED REYNOLDS IS REMEMBERED 102 YEARS AFTER HIS DEATH. Famous Freshwater soldier/engineer, Fred Reynolds, who was killed in action on 25 April 2015 at the Gallipoli landing, has been remembered by his descendants and the Freshwater community at a ceremony in the Soldiers Avenue of Honour on 23 April. 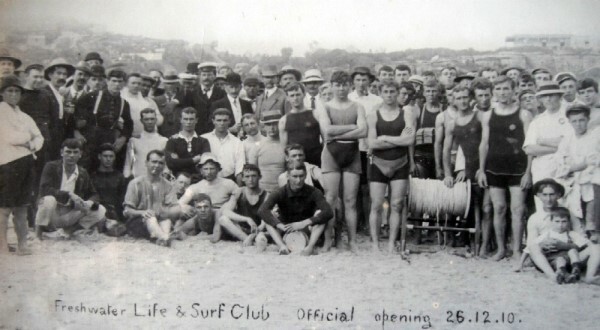 Reynolds, who lived, until enlistment, at 50 Crown Road with his family, was a very keen surfer. At the time of his death, Reynolds was seen using his surfing skills to rescue other wounded soldiers during the chaotic landing on the beach at Gallipoli. He was hit by a sniper’s bullet. For the last few years, Soldiers Avenue resident, Wendy Machon, has been researching Reynolds and his family tree. Machon, as part of the Soldiers Avenue of Honour Stakeholders Group, was determined that there be an appropriate memorial for Reynolds in Soldiers Avenue rather than a tiny plaque in the roadside gutter. At the Centenary of Anzac in 2015, a Lone Pine was planted by the then Premier, Mike Baird, in Reynolds’ honour. The surround, built by Freshwater resident, Roy Buirchell, is painted in the regimental colours of the Royal Australian Engineers. A bronze Footpath Memorial Plaque was also installed in the footpath adjacent to this memorial. A full history of his short life has also been prepared by Machon, and this was made available to his descendants. The sign on the window says that it has closed for renovations, but the word on the street is that it has closed permanently. It will probably be replaced by another Café on this prominent but high rent site. A unique Pig-face “waterfall” has spectacularly grown over a cliff in Undercliffe Reserve. (See image attached). This common native plant, which Northern Beaches Council often uses as a salt tolerant ground cover, is also called ice-plant or angular sea fig. Its pollinated fruit tastes like salty strawberries, and its purple flower is eaten by aboriginals as bush tucker, much as one would eat zucchini flowers. The fleshy leaves were cut up for salads and provided aboriginals with a source of salt. The Freshwater Community Garden, as part of its “Bush Tucka “project, has a garden bed full of pig face. FRESHWATER COASTAL OPEN SPACE AND RESERVES MASTER PLAN UPDATE. Friends of Freshwater, along with Freshwater SLSC, Harbord Diggers Club and 8 representatives of the local community have met on three occasions over the last two months to develop a draft Master Plan for the upgrading of the Coastal Reserves. These reserves extend from South Curl Curl to Queenscliff. MOORE ROAD BOULEVARD OF TREES WITH LANDSCAPE ARCHITECTURE DESIGN FOR TURNAROUND AT THE BEACH. TREATMENT OF LUMSDAINE DRIVE AND THE DIGGERS LEASED EASTERN CARPARK. IMPROVED AMENITY INFRASTRUCTURE SUCH AS PUBLIC TOILETS, WASTE RECYCLING, WATER BUBBLERS ETC. This is a once in a generation opportunity to upgrade our Beach Reserves with funding from the Council amalgamation allocation. NEW COMMITTEE MEMBERS ELECTED TO FRIENDS OF FRESHWATER EXECUTIVE. At its Annual General Meeting held on 26 June, Freshwater residents, Christine Frith, Holly Carroll and Kent Bull were elected to the Committee. They accompany Sean Rout who was re-elected. Peter Harley was again elected President and Phil Curry, Vice-President while Denise Goldstein was re-elected as Treasurer. Our Inaugural Secretary, Brian Dunphy, after 7 years of involvement, decided not to stand and his position was filled by Stacey Berkman. Dunphy, did much to set up the Friends as a Not for Profit Incorporated group and his contribution is much appreciated. Committee Member, Samantha Clutton Ansley, also did not stand. as she has moved to Port Macquarie, but her contribution, particularly to the Optus Tower Campaign was very significant. A further grant of $49,400 has been sought from the Northern Beaches Council Stronger Community Grant Program, Round 2. This has been sought for the preparation of a Moore Road Master Plan for the linkage between the Village and the Beach. These projects will guide our work for the coming year. When non-compliant, red-brick, medium density housing, was being erected across the Freshwater Basin during the 1970’s, many of the residents were opposed to both the consolidation of property and the rapid change in the fabric of their neighbourhood. Some of these Unit Buildings gained dubious approval by exploiting loopholes in the then LEP or simply by corrupt activities. This led to Warringah Council being put into administration for the first time. A large number of residents banded together and fought against these developments, and even stood for Council elections, after the Council had moved out of Administration for the first time. This eventually led to WLEP 2000 which belatedly removed these anomalies. One of those many activists was Jeanette Ward and it is always a delight to see her around the Village and continuing her activism as a Member of the Friends of Freshwater. 2017 MEMBERSHIP OF FRIENDS OF FRESHWATER CONTINUE TO Strengthen OUR VOICE.